Today is the third installment of Professor Pat’s dissertation on Modern Portfolio Theory (MPT). In it, he’ll be including three other uncorrelated asset classes that can be added to a portfolio that will not only increase returns, but lower risk as well. The floor is all yours, Prof. Pat! 1. Real Estate Investment Trusts (REITs) performance per the Dimensional Fund Advisors (DFA) U.S. Real Estate Securities Index. 2. International Large Company Stocks per the DFA International Value Index portfolio of non U.S. Stocks. 3. International Bonds composed of the DFA Five-Year Global Fixed Income Index Fund. 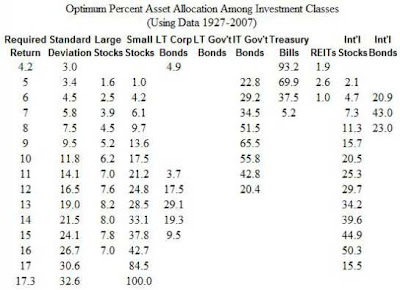 In comparing this table to the one from Part II (with fewer asset classes), you can see that the minimum return has been slightly increased with no increase in the standard deviation which is our measure of risk. Actually, for all levels of portfolio return the risk level is the same or reduced. By adding the proper mix of international stocks and bonds to a portfolio measurably decreases risk. In Part II we looked at the 11% return level. You can see the addition of international stocks reduces portfolio risk from 14.9% to 14.1%. Note that there is no downside to this–the lower risk is obtained at no cost or penalty. The portfolio at this level contains about 7% Large-cap US stocks, 21% Small-cap US stocks, 4% Long-Term Corporate bonds, 43% Intermediate-Term Government Bonds, and 25% International stocks. The overall decline in the recommended level of Large U.S. stocks in favor of Small U.S. Stocks and International Stocks is noteworthy. From the above table we see again that Long-Term Government Bonds are an unattractive component in an investment portfolio. No wonder the 30-year treasury was abandoned! One thing this table is telling us is that maintaining a component of international stocks or bonds in your portfolio is very beneficial. While they may not be completely uncorrelated with the movement in the US stock and bond markets, they do serve as a currency hedge against a declining dollar. So, how do you, the investor, take in all this data and decide which level of risk and return and hence which portfolio allocation is suitable for your personal situation? One question to ask yourself is how much draw-down can you tolerate? (Draw-down is the financial term for decline in value.) There are a number of criteria you should consider in answering that question. 1. Time horizon and cash needs: These dictate how much time you can allow your portfolio to compound in value. If you won’t need to tap into the assets of your portfolio for many years means that you can take greater risks, but you must also be willing to accept short term declines. If your tolerance for risk is low, then choose a slightly more conservative allocation. Folks nearing retirement should limit their risk and opt for the most conservative allocations. The precise allocation depends on how much money they’ll need to withdraw from their accounts and how long they’ll need their portfolio to last. 2. Standard of living: The size of the portfolio relative to the needs of the investor to maintain their living standard also plays a part in the determination of suitable allocations. A portfolio sized far in excess of the retirement needs of the investor can be more aggressive. Conversely a smaller portfolio that constitutes a safety net or is targeted for specific needs such as a child’s college education or wedding should be allocated more conservatively with greater surety of being intact if or when it will be needed. 3. Current income level: The level of current income outside of the portfolio contributes to the investment allocation decision as well. If the investor is able to earn a living from income without touching the portfolio then again a more aggressive stance can be assumed. The reliability of this income is another contributing element. Those more secure in their employment can assume more risk; those who are unsure should not. 4. Risk tolerance: Your attitude toward risk and your emotional ability to see your nest egg temporarily drop in value is important as well. Investors should ask themselves if they will tend to panic and precipitously sell out when things go south thereby missing out on subsequent recoveries. Again, those with tendencies toward pessimistic gloom and doom should remain conservative and comfortable accepting lower expectations. The next and final installment of this article will discuss asset class correlation, the validation of optimum allocations over portfolios dedicated solely to individual asset classes, and recommendations for specific mutual funds that can serve as suitable proxies for these asset classes. Hang in there, for the last installment is chock full of good stuff! *Note from Dr. Kris: Savvy investors with a lot of money in their portfolio can elect to include futures and/or options trading strategies to lower their portfolio risk while increasing returns. For one example, see my April 17th blog on using derivatives to add value while reducing risk in your portfolio. This entry was posted on Wednesday, April 23rd, 2008 at 9:59 am	and is filed under Uncategorized. You can follow any responses to this entry through the RSS 2.0 feed. You can leave a response, or trackback from your own site.